The beautiful looking HTC One X has been released in the UK today (Thursday 5 April) with industry experts suggesting that it’s the best placed handset to take on the soon-to-be released iPhone 5 and Samsung Galaxy S III. Winning best in show at the the 2012 Mobile World Congress, the HTC One X had already begun winning awards before it was even released, beating off the Sony Xperia P and the 41-megapixel Nokia 808 PureView. There are already a number of tempting offers on the market with leading mobile phone retailers offering a free handset and cashback that will effectively bring the rental price down to under £26 a month. 2012 does appear to be the year that the smartphone market becomes more competitive with some genuinely strong handsets being released. And these competitive prices have positioned the HTC One X as a real contender to break the the dominance of the iPhone 4S and Samsung Galaxy SII. 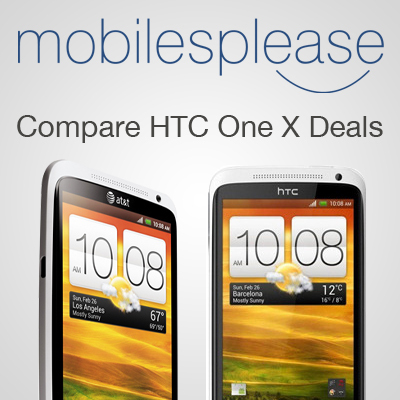 Mobilesplease compares all the leading HTC One X deals in the UK and will find you the best contract for the new HTC One X. If you want to learn more about the HTC One X, why not read our HTC One X review.